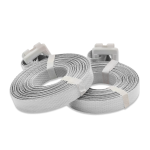 CWC pre cut polypropylene straps are 17' in length and come with a pre-attached poly buckle. They are a quick easy way to strap pallets and cartons. Color code for quick identification.